The National Weather Service in Kansas City says the severe winter storm is starting to gain momentum. 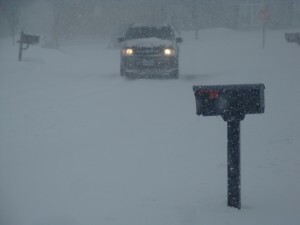 Some areas of the state might see as little as six inches of snow, others as much as two feet. A four-wheel drive truck struggles to navigate this neighborhood street in Ashland, a small town in Central Missouri. Visability has decreased dramatically. Meteorologist Andy Bailey says the heaviest band goes from the Southwest Part of Missouri up to the Northeast, with Central Missouri likely to be hardest hit. The high winds have started blowing meaning visability has dropped to less than a quarter of a mile, making travel perilous for motorists and making it difficult for road crews to keep blowing snow cleared from the roads. The winds are expected to keep blowing from 30 to 40 miles per hour through Wednesday, when the temperature is expected to drop to near or below zero. Wind chills will drop that down to “well below zero,” the National Weather Service reports.